The PowerPoint Rehearsal feature helps you rehearse your PowerPoint presentation. 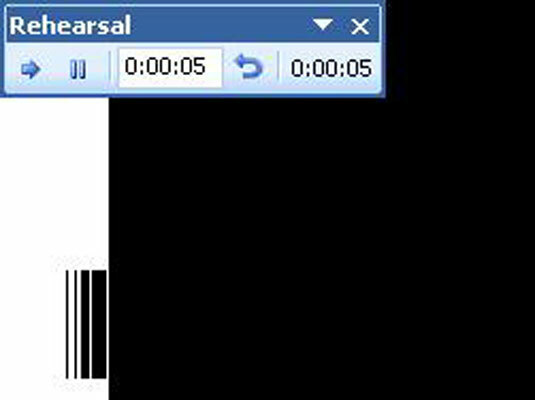 The Rehearsal feature lets you know how long your presentation takes, and can set PowerPoint slide timings so that the slides automatically advance based on the timings you set during the rehearsal. 1Choose Slide Show—Set Up—Rehearse Timings. This starts the slide show, with a special Rehearsal dialog box visible. 2Click or use keyboard shortcuts to advance slides. As you rehearse, the Rehearse dialog box keeps track of how long you display each slide and the total length of your presentation. PowerPoint displays a dialog box that gives you the option of applying or ignoring the timings recorded during the rehearsal to the slides in the presentation. If you were satisfied with the slide timings during the rehearsal, click Yes. If you mess up during a rehearsal, click the Repeat button. Clicking this button restarts the rehearsal from the beginning.